I love soup. Summer or winter. Hot, cold, savory, sweet. I just love soup. I got this cookbook for Christmas about 8 years ago. From my dad. Which is kind of funny, because I gave him the exact same book that Christmas! 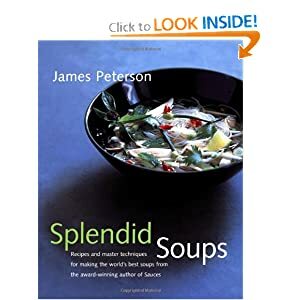 I've made a bunch of different soups from that book. A few of my favorites are the Chestnut Puree (great for Thanksgiving), Creamed Chile Soup, Roasted Red Bell Pepper and Onion Soup, Chicken Broth with Cheese and Bread Crumb Dumplings and Chicken Soup with Apples and Leeks (possibly my favorite soup ever). I also found that I end up needing a lot of soup stock, or broth. It makes more sense to prepare a pot of broth on a rainy Sunday and keep it around for throwing together last-minute soups than it does to wait around for a broth to cook every time you want to make a simple soup. And having chicken broth around all the time is great for everything from stir-frys and sauteeing to making pasta and rice. I use chicken broth instead of oil or butter when stir-frying veggies or chicken and when sauteeing just about anything. And I like to use chicken broth instead of water when making rice or couscous. Broth is easy to freeze, but not everyone (and I am one of them) has freezer space for more than a litte extra broth. If you don't have room, you can refrigerate the broth for 5 days without its spoiling. To keep it long, just bring it to a simmer on top of the stove for 10 minutes, let it cool and regrigerate for up to another 5 days. You can repeat this trick indefinitely. Better yet, use the broth in place of water to make your next batch of broth! Put all of these into a very large pot. Cover it with water (or use the chicken broth already in your refrigerator) and add an additional 2 -3 inches of water. Bring to a boil and simmer for about an hour. Let the broth cool a bit, then strain it. Return the broth to the pot and discard the bones and other remaining ingredients. Add enough water to double the amount of broth and simmer until the amount is halved (or broth is concentrated enough for your taste). Now you've got chicken broth whenever you need it! This process works with your leftover turkey carcass and with beef or other meat bones as well. I make my Chicken Broth and it is so much better than what you get at the store. Your recipe looks great! Have a great weekend and thank you so much for sharing with Full Plate Thursday.